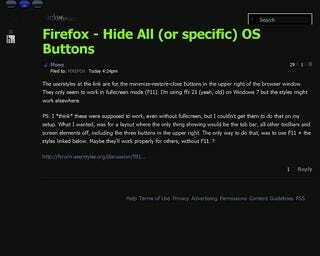 The userstyles at the link are for the minimize-restore-close buttons in the upper right of the browser window. They only seem to work in fullscreen mode (F11). I'm using ffx 21 (yeah, old) on Windows 7 but the styles might work elsewhere. PS: I *think* these were supposed to work, even without fullscreen, but I couldn't get them to do that on my setup. What I wanted, was for a layout where the only thing showing would be the tab bar, all other toolbars and screen elements off, including the three buttons in the upper right, like in the image. The only way to do that, was to use F11 + the styles linked below. Maybe they'll work properly for others, without F11. ?